Well, it's been over a month now living in the Marina. I have to say, the people we've met and gotten to know are unbelievable. Everyone will go out of their way to help you. In such a short time there are some that have become good friends. We've enjoyed all our new friends and all the dock parties. But now it's time to move on. Our plans now are to start sailing the Islands around La Paz and North. After a few weeks we'll probably come back for Carnival and then out again. 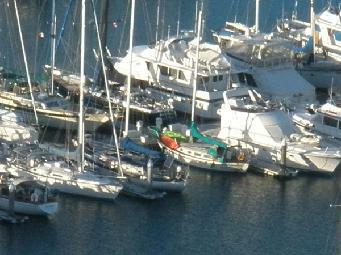 Some of our new friends will stay in the Marina, some, will be out there sailing around and I'm sure we'll run into them.